Sounds Good Westchester - Hear what people are saying about Sounds Good Westchester! Hear what people are saying about Sounds Good Westchester! We have been taking music classes with Karen since my son was a few months old. She is exceptional. Her facial expressions, engagement with children, range of music and control of the class makes this an enjoyable experience for both 'mommy and me'. She knows every child by name and engages them on an individual basis which makes this a personaI experience for each child. I like the way she has named her guitar 'Ginger' and encourages the children to touch and play the guitar at the start and end of the class. Whenever my son sees a guitar in a book he says 'Karen '!! A great class which I will remember fondly as part of his early childhood learning in years to come. We are forever grateful to Music Together®, particularly Jean Young, for kindling a love for music in our daughter. Although she’s very shy, she looks forward to Saturdays – her music class day. She won’t sing along a lot in class but she will sing and hum songs, and find music in routine regular things as well as things that fascinate her. We’ve made many friends at class. The CDs have made all car trips enjoyable. Thank you so much for this additional connection with my kids – the connection of music. Everything about the Sounds Good Westchester program is so thoughtfully organized and executed. Karen and her teachers are wonderful, both as musicians and as early childhood educators. They recognize where children are at developmentally and know that the magic often happens at home! My 2-year-old, who regularly roams the room during class, returns home demanding to listen and “sing along” to his favorite Music Together songs. I am so thrilled we stumbled upon the perfect early childhood music class! My son Andrew is 18 months old and we have been doing the Music Together Generations class at The Osborn for almost a year. It is one of the highlights of our week. Jean is a wonderful, dedicated teacher who is clearly passionate about what she does, very skilled, and incredibly patient with the children. The seniors love to interact with the little ones, and the little ones enjoy the audience so this makes it a very special setting. We love listening to new music each semester (and revisiting old songs), and it is a surefire way to keep Andrew calm during car rides! It has also made me more aware of being musical and trying to model and encourage this with my son as much as possible. I cannot recommend this program enough! My son has participated in Music Together classes since he was just under 5 months old (he's now 17 months). It has been a joy to watch his love of music grow, encouraged by the fun and engaging classes he attends each week. I've been especially impressed by the fact that the classes work for children at all different stages of development. And I can't say enough about the Sounds Good Westchester teachers (I hate to embarrass my son, but he's fallen in love with both of his teachers). My son started his journey with Music Together when he was just 4 months old. He is 2.5 now and the songs have helped us survive countless road trips and even a cross-country move (I'd choose the "Hello Everybody song" on repeat over a screaming baby any time)! He sings, dances and now shows his little sister all the moves. It is priceless. We love Karen! Music Together has been an amazing experience for my son and me! We started when he was four months old and now he is a high-energy toddler. He loves playing with the instruments and watching the other kids in class. Karen is a spectacular teacher and always seems able to refocus him back to the music and activity. He loves it when we sing the songs at home and will ask for more when the CD is over. And the CD! That has been a blessing in the car. He instantly calms down when I pop one in. My children and I have tried other music classes, but none compare to Music Together classes. Music Together is the champagne of music classes! Sounds Good Westchester has amazing teachers and a great variety of locations and times that suit our needs for each semester. My daughter Kaia and I have been having so much fun in the Music Together Generations class at King Street. Watching the eyes of the residents light up when the children arrive and start walking/crawling around to say hello is amazing. You can often hear everyone saying "The babies are here!!" as you walk down the hall. Just knowing that we are brightening the residents' day while enriching Kaia's love for music at the same time is so rewarding. We really look forward to it every week! Last week Tuesday, my son and I went to the Larchmont library in the afternoon. While he was playing with the trains, a little guy spotted us and stood right in front of me. It was Reid!!! He looked at me and before I could even say a hearty hello, he sang "Leaves are falling..." then I sang back, "softly floating" and together we sang, "tumbling to the ground". I gave Reid a high five and gave my son Luke a high five and I couldn't stop laughing. The rest of the adults with their children just looked at us and then I had to chuckle and explained, "We have this little thing going on with our music program called Music Together. Everyone is just like family!" This just goes to show that music is a universal language with no language or cultural barriers. I walked away knowing that enrolling in this program has been the best thing we have ever done for our son Luke. If you are looking for an educational and fun music class for your children stop looking - Music Together in Southern Westchester is wonderful. My 2 1/2 year old son has been doing classes for a year and constantly breaks out into song. The class has given him the confidence to sing merrily to himself and me and really anyone that will listen. The songs are all really original and tap into children's imaginations. We love our classes. I tried and tried but I can't sing, can't play anything, don't even understand when people say someone is "flat" or "off key". But your class really helped me! I know it is so funny but I can sort of hear the sounds in a different way now. And the boys might disagree, but I think my singing has gotten much better. I really miss coming to class with them. 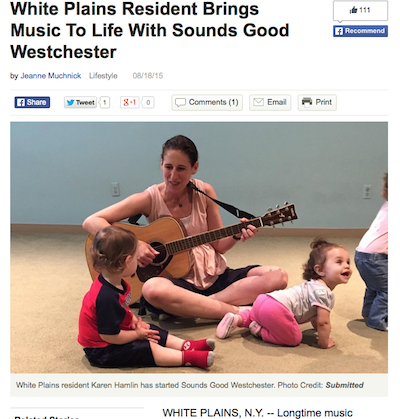 My 3 year old absolutely loves Sounds Good Westchester! She literally can't wait for weekly music class and gets so much out of it, as she sings all the songs all the time, including singing herself to sleep! We have taken Karen's class this past year and Jean's classes the previous year. Can't wait for this coming fall for Music Together again! My daughter is 18 months and we have been taking Music Together classes with Karen for almost a year. She absolutely loves the classes, and so do I! We listen to the music all the time, and she is now able to sing a long a little. Karen is a wonderful, dynamic, teacher who has an amazing ability to engage children of all ages, and teach them her love of music. We look forward to the classes each week! I started music together classes with my daughter at 10 months and we are hooked!! If she ever gets a little cranky on a long car ride I put on the music together songs and it is MAGIC, all is calm! !